The Sculptural octagonal panels are designed in the BELLINI MASTERCRAFT Mahogany single leaf exterior doors. The Doors manufactured for the residence in Alhambra Blvd, in Coral Gables are operated with custom manufactured levers. BRICKEL hinges and a super imposed molding framing the octagonal panels enhance the design of the entrance doors. Since 1992, the BELLINI MASTERCRAFT door is manufactured with superior craftsmanship. The uncompromising dedication of the manufacturing plant, the design team and the customer service makes the doors the best option for the protection and enhancement of the home. 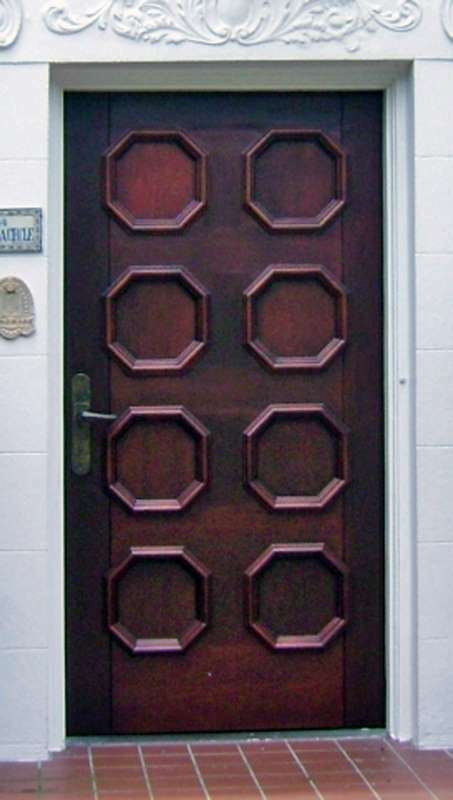 Tested for water infiltration, Forced entry, Impact and cycling, under the strictest codes of Hurricane resistance, the Impact Mahogany Entrance Doors will protect homes in the coastal areas of the United States and the Caribbean Islands from the storms and Hurricanes that often hit these areas. The strong composition of the manufacturing of this thick "Impact Mahogany Entrance Door" will insulate, enhance and protect the homes in the regions of colder winter’s conditions from the wrath of Mother Nature.